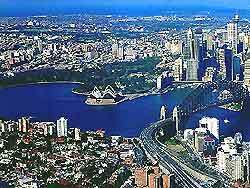 One of the most visited cities in the whole of Australia, Sydney is located in the state of New South Wales and is famous throughout the world. Sydney is full of truly world-class landmarks and structures, which include both the Sydney Opera House and the Sydney Harbour Bridge. Together with a host of sandy beaches, water sports, entertainment venues, shopping districts and nightclubs, it is understandable why Sydney is such a popular and sophisticated city.